Pack an extra pair of socks, shirt and shorts/skirt. The Children’s Museum of the Lowcountry (CML) has a water room called Waterwise, and although they provide smocks, your kids might still get wet. If you're planning to visit the Children's Museum of the Lowcountry (CML), please know that Saturdays (9 a.m. to 5 p.m.) and Sundays (12 p.m. to 5 p.m.) are very busy. The Children's Museum of the Lowcountry (CML) is closed on Mondays. These indoor activities are good year-round. The Children's Museum of the Lowcountry (CML) is free for children 12 months old and younger. 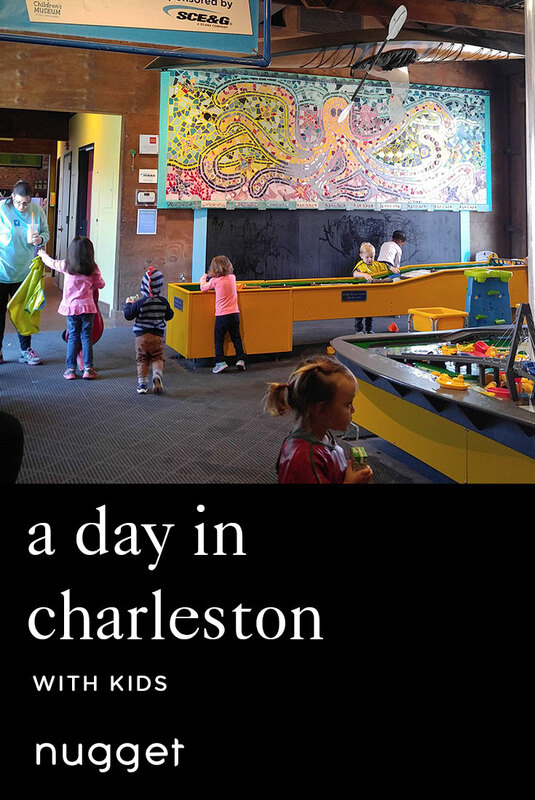 What to do in Charleston with kids when it’s raining? This family-friendly mini-adventure only contains two locations, but both locations are jam-packed with interactive activities for when the weather isn’t cooperating. Splash around at the water tables at the Children’s Museum of the Lowcountry (CML) and explore the many other themed rooms, like the Medieval Creativity Castle. Then go to The Alley, where your kids can bowl and play arcade games. It’s also a great place to grab a bite. Their fried chicken and waffles are a hit with families. Everyone will go home fulfilled. When you step into The Children's Museum of the Lowcountry (CML) parents will feel that they just don't belong. It's a place for kids - just check out the small front door that's just their size but not yours! There are many rooms you must explore for art, fun and imagination such as the Medieval Creativity Castle. But don’t forget to go to my nuggets’ favorite place while at CML - Waterwise, an activity station with water tables galore, high and low ones. Don't worry, smocks are provided, but it’s still a good idea to bring extra clothes, just in case your kids have too much fun and get wet! DIRECTIONS The museum is located downtown, off of Ann Street, between King Street and Meeting Street. Parking is available in the Charleston Visitor's Center parking lot, or there is street parking. TIP If it's not raining, enjoy the outside scenery garden, fire truck, and tables and benches where many families have a “brown bag” lunch. The Alley is a one-stop shop for arcade games, great food and bowling! My nuggets love everything about The Alley, especially the arcade games, which are a must before you hit the bowling lanes. They arcade games are made for adults, so a stool is always needed or else young kids can't reach the games. The food is wonderful, particularly the boiled peanuts and fried chicken and waffles. DIRECTIONS From CML on Ann Street, make a right onto King Street, heading north. Drive four blocks, and make a right onto Columbus Street. The Alley will be on the right. TIP If you're planning a visit to The Alley, call once it's open and reserve your lanes. They book up fast! I'd suggest going before 4 p.m. After 4 p.m., it becomes packed with young adults. Also, there are a couple of open parking lots in this area but only some are free and others are at a cost, so please pay attention to where you park.